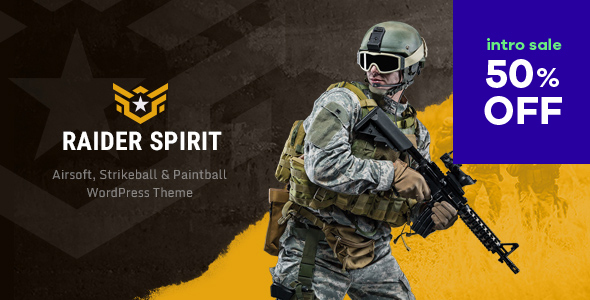 Raider Spirit is a stylish, modern & responsive two-skin Paintball Club WordPress Theme. It is designed for paintball club, strikeball club, airsoft and community. It also works for a strikeball company, game, firm, organization, etc. Due to full WooCommerce compatibility, you can build an online shop / store of clothing & equipment. Raider Spirit is made compatible with WPBakery (aka Visual Composer, which we think is better than Elementor). Also, it works with Woocommerce, Slider Revolution, Essential Grid. Furthermore, to interact with your customers the theme is equipped with Booked Appointments, MailChimp for WP & Contact Form 7.